Not all blog owners know the best ways to update labels, with the posts in their blog. 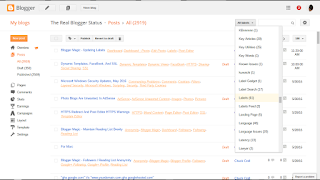 We see occasional signs of confusion, in Blogger Help Forum: Learn More About Blogger. How do I add a label, to many posts at once? How do I correct the spelling of my label, already added? How do I remove all of the labels, from one of my posts? These owners are not aware how to use the dashboard Posts page - and Post Editor - to add, delete, and edit labels. 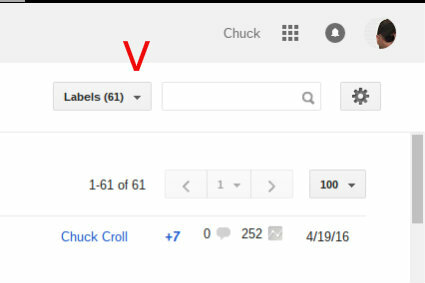 Blogger gives us labels (aka "categories") - and two ways to manage labels. You choose the appropriate procedure, based on what changes are needed. The difference is whether you have one label, that needs to be applied to many posts - or one post, that needs multiple labels applied. 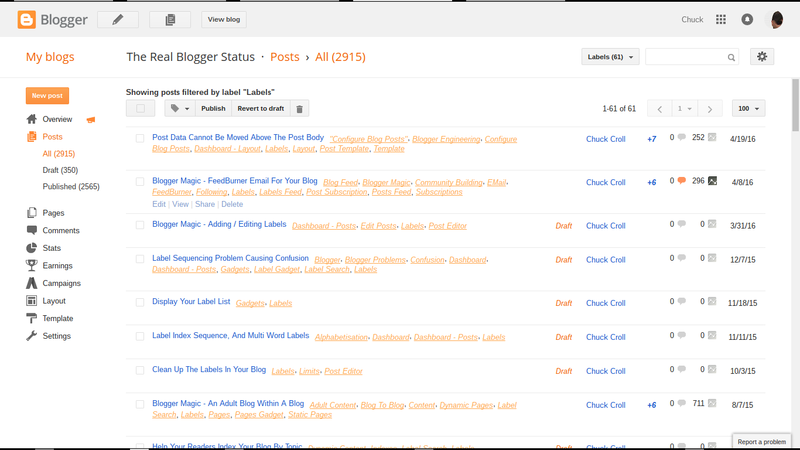 Using the dashboard Posts page - one label, many posts. 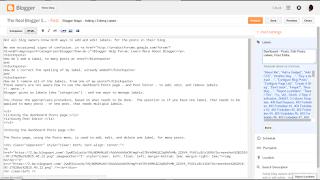 Using Post Editor - many labels, one post. 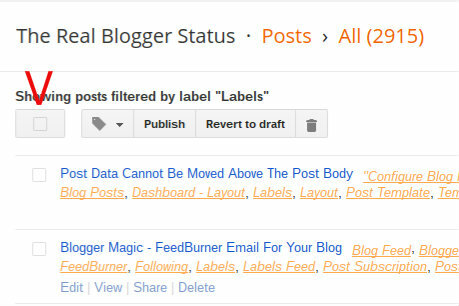 The Posts page, and the Posts menu, is used to add, delete, and edit one label, for many posts - one label, at a time. 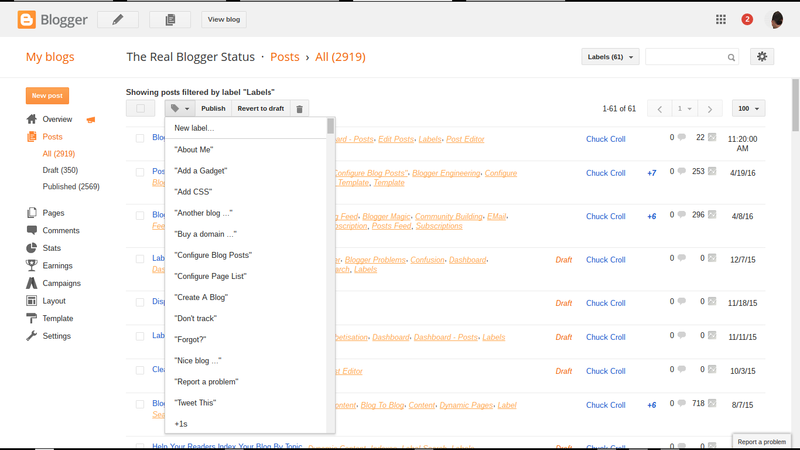 Use the Label Selection list, to select the posts to display. 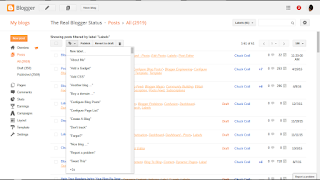 Use the Posts Selector column, to select any or all posts displayed, for action. 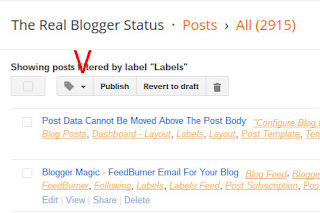 Use the Label Action list to add, delete, or edit a given label, for the selected posts. To add a label, click on "New label...", type the new label, enter the new label, and click "OK". 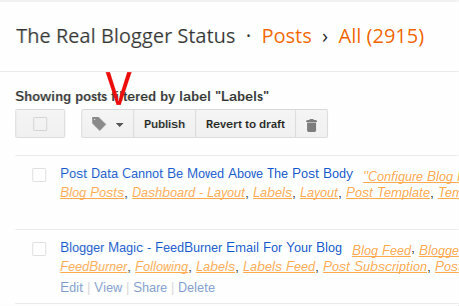 To delete a label, click on any label that has previously been applied to all posts selected. 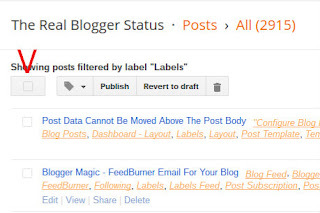 With any one post selected that does not have the label clicked, that label will be added as necessary. To edit a label, you have a slightly more complicated procedure. Repeat as necessary, for another label. Open the Label Selection list, by clicking on the pulldown arrow. Select the posts for the label needed. 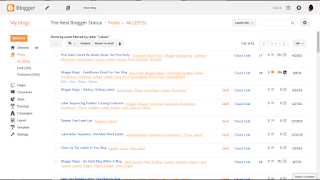 Use the Posts Selector column, to select any individual posts, or all posts, for action. Open the Label Action list, by clicking on the pulldown arrow. Add a label, using "New label" - or delete or edit a label, by selecting one of the listed labels. 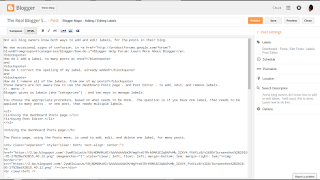 Editing the name of one label, for many posts, requires adding a new label - then removing the old label. This is a slightly more complicated procedure - and is subject to label related limits. 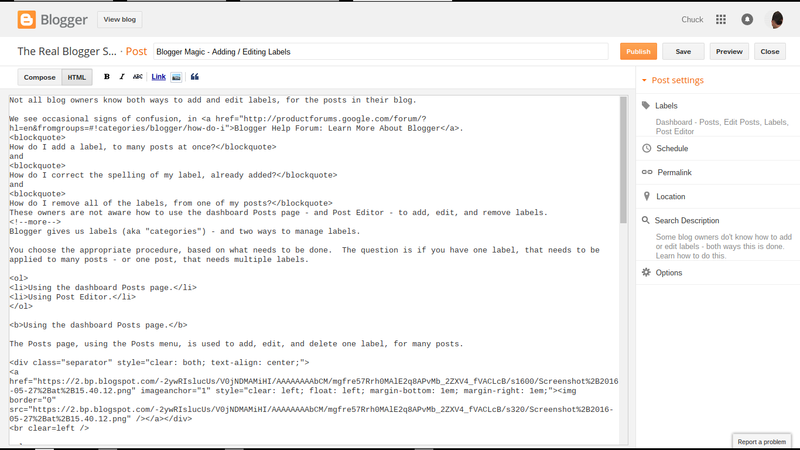 "Editing" a label, using the Posts page, will require planning, in some cases. 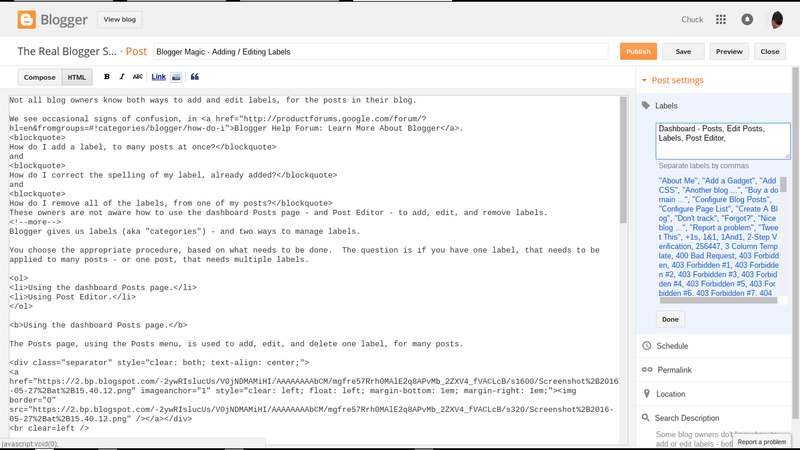 Post Editor is used to add, delete, and edit many labels, for one post - one post at a time. Find and select the "Labels" caption, in the "Post settings" sidebar. In the window that opens, add, delete, and edit as necessary. Select "Labels", in the sidebar. Add, delete, and / or edit the label cloud. If you have multiple labels, in multiple posts, that need changing, you can use a combination of the above techniques. When updating labels, you need to avoid exceeding the limits. Per post label character count. If you exceed a limit, you may have less choices than you would want. If your changes are extensive, you may do well to script the task, before starting. 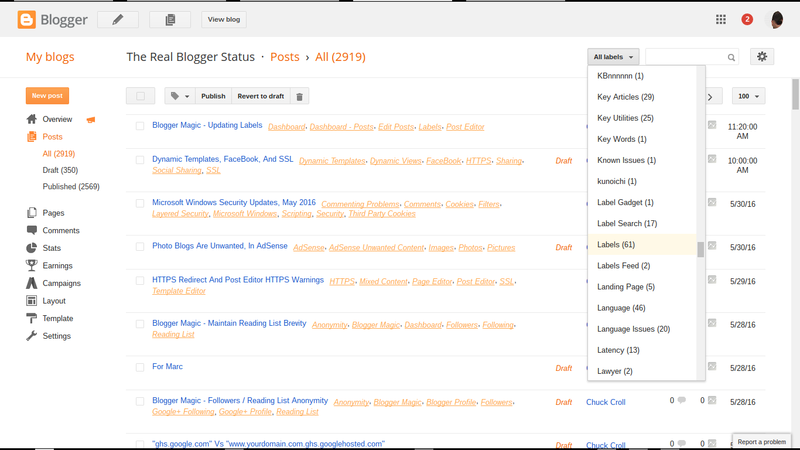 Making label changes, to multiple labels and / or posts, in a #Blogger blog, can be done using either the dashboard Posts page or Post Editor. There are reasons for choosing either alternative.